Hadriana's Treasures: Happy Scribblers Unite! Aah! I feel more in tune with the world...nice fried chicken, carrots, leeks, broccoli, baked potato, penicillin, swilled down with some Vin de Savoie, Mondeuse (where one of my sisters and brother-in-law now reside). What more could a gal ask for? Well...an award, that's what! I've been given the marvellous award by Dumdad, The Other Side of Paris, and I am well chuffed! I chanced upon Dumdad's superior scribbles (a sub-editor living and working in Paris, please correct me Dumdad if my information is incorrect!) through reading the equally excellent The Lehners in France and now they are The Lehners in (Y)UK. If you've not read their respective blogs I urge you to do so now. They both write from the heart with loads of panache. I try to do this and aim to improve with each post I write. I'm reading Michael Wright's "La Folie" at the moment which I had resisted reading but now think is marvellous. I often day dream of living in warmer climes and it turns out that I am living a similar sort of life just without the hot(ter) weather. Oh well, you can't have everything. The reason I love blogs (and books) is that is allows you a peek (or not) into other people's lives. The Lehners in France/(Y)UK....absolutely riveting...Go on give it a go! I'm not joking but there are loads more blogs out there which I could readily nominate. Many thanks, Hadriana. I always feel so undeserving, particularly when there are so many other witty and educative blogs out there.I shall give the award my attention at the weekend and pass it on..
well done on being a superior scribbler. I was laughing at the idea of you swilling penicillin and white wine together- sounds like me! Ah...... that is so kind. What an honour. So pleased you think I deserve it! Wow. Am honoured and flattered to receive this award from you. 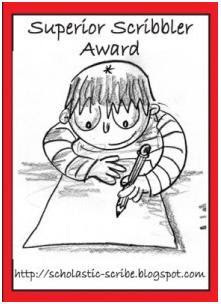 It feels especially meaningful as the character shown in the award is, like me, left-handed. Regrettably though my hair has somewhat receded compared to his, or perhaps he just uses a larger basin. Thank you, thank you! What an excitement, my first award, and my first emoticon, all in the same week! Blogging reaches new heights. Loved your description of food at beginning of post. Plus drugs. What a mix. Thanks again, Hadriana. I am genuinely dead chuffed! Lakeland Jo, I have you marked down for the "seven" meme from FFF, so you've been warned! Maggie May, I know what you mean about certain IT aspects...there is stuff I must get to and sort out! Left handed Troy? My youngest sister is too...so you are in the best of company! Yes LWM: an intoxicating mix of food, wine and medication or is that mastication or meditation?! I think I'm straying into Roman territory again. Trust me! Well, what can I say? You are too kind, Hadriana - congrats on yours and thank you very much for mine! Btw, a dotterel is also noted for the fact that the male incubates the eggs and feeds the chicks; that's where the nickname came from! Ah! The Dotterel - you obviously know your birds. I looked the name up in a few dictionaries and they failed to tell me that. "Bird facts", however, came up with the goods. I'll correct the meaning on the post. Sorry about that! Very good nickname and well deserved award BTW. Thanks very much pet! Will stick it up when I get back from Little Rock. Also thanks for the list of bloggers. There are a few new to me so I'll have to go visit. Expatmum..you are welcome hinny! Have a good trip to Little Rock!! Thank you RM...for your very nice comments! Haddy! thanks for the award, I completely missed that post! !